This is Part 1 of a story Greg Amundson tells in his new book FIREBREATHER FITNESS. Have you ever wanted to learn to surf? Or do a marathon or an ultramarathon? Or join a soccer league? Do you think your exercise program gets in the way? 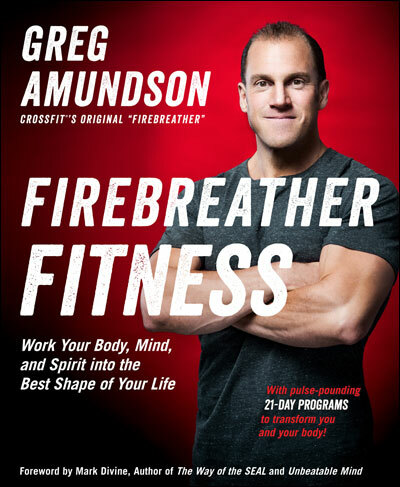 Quite the opposite—the Firebreather Fitness plan is an optimal first step toward making your sports dream come true. There are plenty of 12-week programs out there that promise to get you from the couch to the starting line of a marathon or triathlon. But here’s the problem—without a general fitness foundation and a strengthened set of general skills, along with a knowledge of how to move well, you are going to struggle with the training. Also, when it comes to an activity with a lot of repetitive movements, not knowing how to move well can have adverse effects on your joints and body. Firebreather Fitness plans address several general athletic skills: cardiovascular/respiratory endurance, stamina, strength, flexibility, power, speed, coordination, agility, balance, and accuracy. Together, these build in you a super-sound athletic foundation and will allow you to pick up a new sport more readily and enjoy it with less risk of acute or chronic injuries. Furthermore, the converse is true: Taking on a new sport will do wonders for your fitness goals. It will energize your training with a new goal, and it will draw greater nuances from the general skills into your body and mind as what you learn will be fed back into your growing capacities. In 2009, I hit a major snag during the qualification for the CrossFit Games. I had been training consistently for eight years and had continued to improve every year. I had put my training to use in various roles, including serving in the Army and as a SWAT operator with the sheriff’s office in Santa Cruz. I considered myself well prepared for the unknown and the unknowable. I had even been dubbed the “Original Firebreather.” Given all this, qualifying for the Games was surely in my wheelhouse. But there’s always a reality check in the pursuit of preparing for the unknown and unknowable. It’s always ready to put you to the test and weed out weaknesses in your training program. It will keep you humble. As it did with me in 2009. Take a look at Part 2.